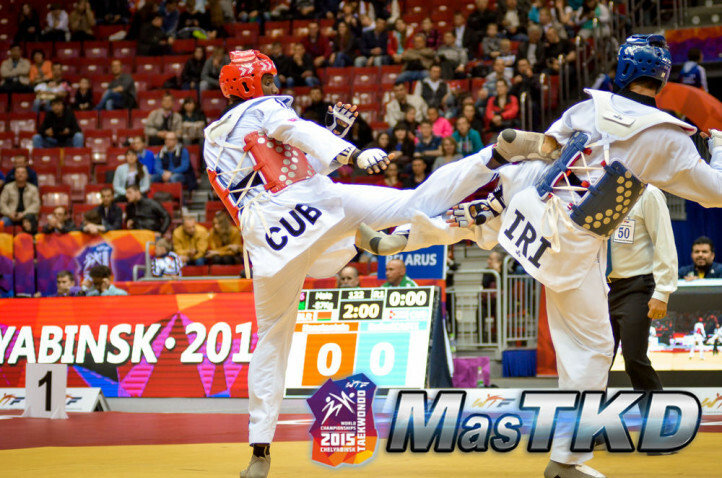 Russia - 2015/05/17 - Korea won two gold medals and Great Britain captured one gold on the fifth day of the 2015 WTF World Taekwondo Championships. In the female -53kg division, Korea’s Geum-byeol Lim won gold, leaving Chinese Taipei’s Yun-wen Huang with silver. Greece’s Andriana Asprogeraka and Croatia’s Ana Zaninovic won bronzes. In the female +73kg category, Great Britain’s Bianca Walkden won gold, France’s Gwladys Epangue took silver and Russia’s Olga Ivanova – a native of Chelyabinsk – and Turkey’s Nafia Kus shared bronzes. And in the male – 54kg division, Korea’s Tae-hun Kim took gold, Russia’s Stanislav Denisov took silver, and Thailand’s Ramnarong Sawekwiharee and Brazil’s Venilton Teixeira took bronzes. In the first final of the night at Chelabyinsk’s packed Traktor Arena, the 17-year-old Lim, the world ranked 27, faced Huang, the top seed in the division and the gold medalist at the 2014 Incheon Asian Games in Korea. The opening round was lackluster. Both athletes foot-fenced, leaving the scoreboard frozen at the end of the round. The second was livelier. Lim’s coach appealed a head kick, which was awarded, giving her three points. Lim then grabbed another point, compelling Huang to attack. She drove Lim to the edge of the mats, picking up two points in the process. The round ended 5-2 to Lim. Round 3 began with Huang driving Lim around the perimeter of the mats; the score rose to 6-3, then another appeal by the Korean coach was accepted, granting 9 points to Lim. Yet another video replay appeal was rejected. With 25 seconds to go, Huang went all out, but the match ended 10-5 to the Korean. In the female -73kg category, Great Britain’s fifth-ranked Bianca Walkden, the winner of the 2014 European Senior Championships in Baku, Azerbaijan and the bronze medalist at the 2014 WTF World Taekwondo Grand Prix in Suzhou, China, faced off against France’s Gwladys Epangue, fourth-ranked in the world, winner of the 2011 WTF World Taekwondo Championships in Gyeongju, Korea, and bronze medalist at the 2008 Beijing Olympic Games in China. In Round 1, the Briton started fast, firing jackhammer side kicks: her opponent kept her distance and stalked from the center of the ring. There was a brief flurry of venomous kicks, but neither found the range, with the French girl daring Walkden to score by opening her arms. The round ended with the scores level at 0-0. Round 2 also ended with the scoreboard empty. Round 3, however, brimmed with drama. Epangue finally connected with a round kick to the body, giving her a one-point lead. She maintained that until, with just 22 seconds remaining, the French girl faltered and the British girl scored to the head. Three points appeared on the board – but were disallowed. The British girl lost a penalty point, then, with 10 seconds left, the French girl fell again – the two falls giving Walkden a point. With barely seconds left on the clock, Walkden, firing on all cylinders, connected to the head. The points flashed up, the disbelieving Epangue looked devastated and the final score was 4-2 to the Briton. 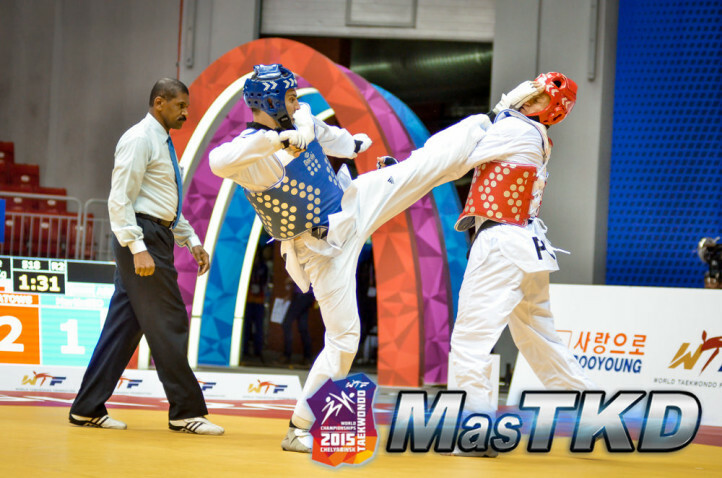 Finally, in the male – 54kg division, 25th ranked Russia’s Stanislav Denisov, bronze winner at the 2013 WTF European Junior Taekwondo Championships in Chisinau, Moldova, faced off against second-ranked Tae-hun Kim of Korea, defending world champion and the gold medalist at the 2014 Incheon Asian Games in Korea and winner of the 2014 WTF World Taekwondo Grand-Prix in Suzhou, China. The Russian entered the field of play to thunderous support from the crowd, who have so far been denied a gold at this tourney. In Round 1 the Russian fought flamboyantly with spinning and jumping kicks; the Korean was tactical, controlling the center of the ring. Neither registered a hit, leaving the board empty at the end of the round. In Round 2, the Korean scored with a fast turning kick to the body, then another, giving him a two-point lead. Denisov tried to land his flying spinning back kick, but Kim kept racking up the points, ending the round 5-0. In Round 3, Kim fired fast and furiously, opening his lead to 9-0. The Russian finally scored, winning three points with a spin back kick, then charged into the attack. In the dying seconds, the two athletes went at each other, furiously spinning, jumping and kicking. The final score was 14-7 to Kim. On May 17, Korea’s Hye-ri Oh, the U.S.A.’s Jackie Galloway, China’s Shuyin Zheng and Croatia’s Iva Rados will contend in the female -73kg category. Also, Jasur Baykuziyev of Uzbekistan, Vladislav Larin of Russia, Radik Isaev of Azerbaijan and Rafael Castillo of Cuba will be fighting for gold in the male – 87kg division. And Anthony Obame of Gabon, Firmin Zokou of Cote d’Ivoire, Robelis Despaigne of Cuba and Dmitiry Shokin of Uzbekistan will compete in the finals of the male +87kg category.